Image of three human mesenchymal stem cells. 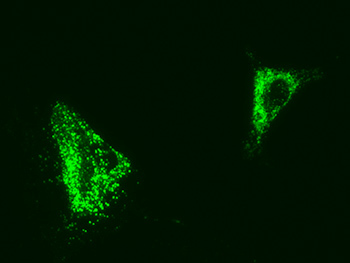 The ATP in the cells is glowing green. The phosphate from the biomaterial (calcium phosphate) that is taken up by the cells is used to make more ATP, which is traditionally the source of energy for the cells. In this case, however, ATP can be converted to adenosine which promotes the human mesenchymal stem cells to be turned into bone cells. With the help of biomimetic matrices, a research team led by bioengineers at the University of California, San Diego has discovered exactly how calcium phosphate can coax stem cells to become bone-building cells. This work is published in the Proceedings of the National Academy of Sciences the week of Jan. 6, 2014. UC San Diego Jacobs School of Engineering professor Shyni Varghese and colleagues have traced a surprising pathway from these biomaterials to bone formation. Their findings will help them refine the design of biomaterials that encourage stem cells to give rise to new bone. The researchers say their study may also point out new targets for treating bone defects and bone metabolic disorders such as major fractures and osteoporosis. While the PNAS findings only apply to bone building, Varghese and her students at UC San Diego are working on a variety of projects to understand how stem cells thrive and differentiate into a variety of cell types. With this information, they hope to design biomaterials that can be used to help transform stem cells into tissues that may someday replace diseased or degenerated bone, muscle, or blood vessels. 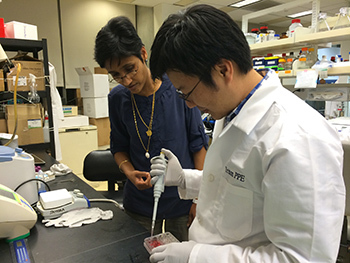 The first author of the PNAS paper, Yu-Ru V. Shih (right), led this research project as a postdoctoral fellow in Shyni Varghese’s (left) “Bio-inspired Materials and Stem Cell Engineering Group” in the Department of Bioengineering at the UC San Diego Jacobs School of Engineering. The first author of the PNAS paper, Yu-Ru V. Shih, is a postdoctoral fellow in Varghese’s research group, the Bio-inspired Materials and Stem Cell Engineering Group. He came to UC San Diego as part of the UST-UCSD International Center of Excellence in Advanced Bioengineering, sponsored by the Taiwan National Science Council I-RiCE Program. This initiative by the Institute of Engineering in Medicine (IEM) at UC San Diego is directed by UC San Diego bioengineering professor Shu Chien. During the course of this study, Shih collaborated with Chien and Oscar K. Lee of the department of orthopedics and traumatology at Taipei Veterans General Hospital. “This research is a testimony to how international collaborations could provide unique opportunities to young researchers to tackle interdisciplinary questions relevant to medical sciences,” Varghese said. The research was funded by the U.S. National Institutes of Health NIH (grant AR063184 to SV) and the UST-UCSD International Center of Excellence in Advanced Bio-engineering, sponsored by the Taiwan National Science Council I-RiCE Program (grant NSC101-2911-I-009-101).